If you have been charged with domestic assault and battery, you need to speak with a Tulsa domestic assault and battery attorney at the Henson Law Firm. Domestic violence is an Oklahoma criminal offense that can occur between spouses, family members, unmarried parents who have children together, people in a dating relationship, or even roommates. Even though domestic issues can be viewed as private, the police will respond immediately to a report of domestic violence and the state will aggressively prosecute anyone arrested for domestic violence. Once the police and district attorney’s office are involved, the alleged victim may lose control over the case. These are serious allegations, and even if the accuser decides not to press charges, you could still face harsh punishment under Oklahoma criminal law if you are convicted. It is also likely that the alleged victim will file a petition for a protective order. The purpose of a protective order is to prevent the alleged victim from facing more threats or abuse. If you become subject to a protective order, you will be prohibited from having any contact, either in-person or electronically (such as by email or text message) with the alleged victim. Domestic violence charges in Oklahoma can be filed as a misdemeanor or a felony. A misdemeanor conviction carries the possibility of one year in the county jail and up to a $5,000 fine. A second or subsequent conviction is a felony and carries up to four years in prison and up to a $5,000 fine. In addition to potential incarceration and steep fines, anyone convicted of a domestic violence offense in Oklahoma must complete a 52 week domestic abuse treatment program under court supervision until the program is completed. If the offense was committed in the presence of a child or if the victim was pregnant, the penalties are more severe. 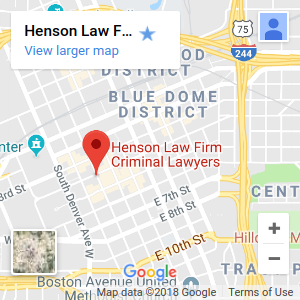 The domestic violence defense lawyers at the Henson Law Firm are dedicated to aggressively defending individuals who have been accused of domestic violence in Tulsa and the surrounding communities. While it is extremely important that victims of domestic violence get the help and assistance they need, it is also extremely important that anyone accused of domestic assault & battery does not face false allegations. Even an allegation of domestic abuse can have lasting consequences to your child custody arrangements, your employment, and your reputation. Domestic violence claims are easy to fabricate and an alleged victim can easily make exaggerated claims to law enforcement. Call a Tulsa domestic violence lawyer at the Henson Law Firm for a free consultation. Need a Tulsa domestic assault and battery lawyer? Contact the Henson Law Firm today!